•MB45: The MB45 combines state-of-the-art moisture analysis with user friendly software, graphic display, and enhanced heating options. 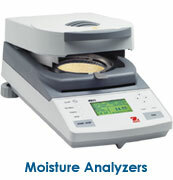 •MB35: The MB35 gives you the accuracy and reliability you need for moisture determination. •Perfect for applications in the pharmaceutical, chemical and research industries; versatile and rugged enough for continuous operation in food and beverage, quality control, environmental and many other applications.